"He errs who thinks Santa enters through the chimney. Santa enters through the heart." 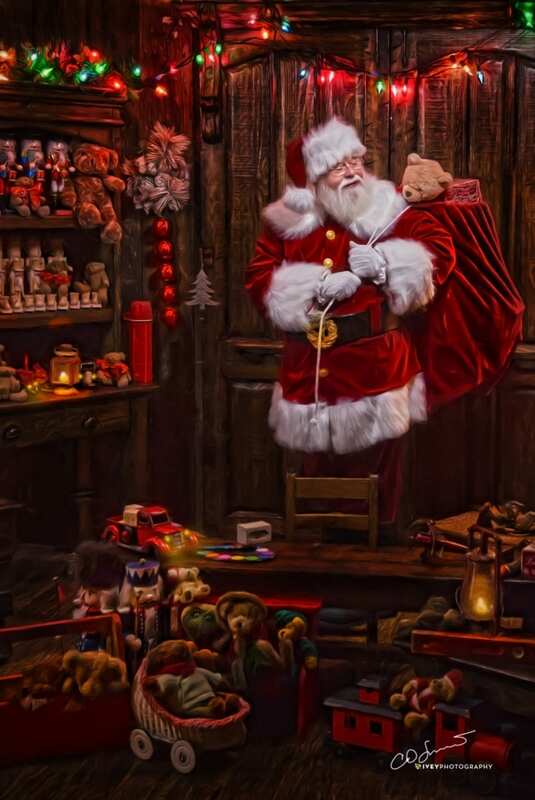 As soon as you enter one of our Storybook Santa studios, the magical, nostalgic feeling of Christmas will overwhelm you. You’ll sit back and watch your children experience the magic, love, hope and wonderment that Santa brings. The Storybook Santa Experience will fill you with laughter, joy and even tears while you’re here. 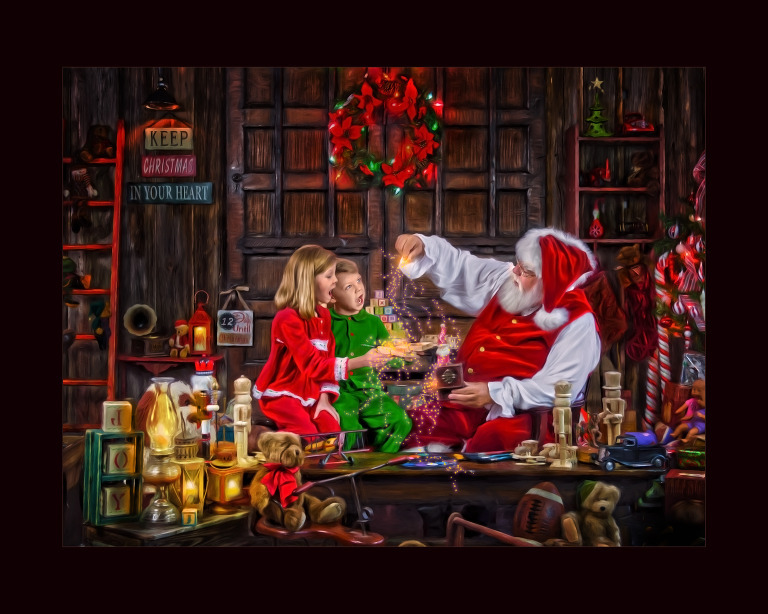 Our hand-finished art pieces will add a timeless appeal to the Storybook Santa experience. 2019 Sessions will begin on Saturday October 6 and end December 24. Be sure to fill out an inquiry form to be sure you get a reservation. We now have locations in Keller, Richardson and Midlothian. We sell out every year. - Beth in Midlothian - "Thank you for the experience of a lifetime for our kids. They will forever remember these special moments with Santa!" 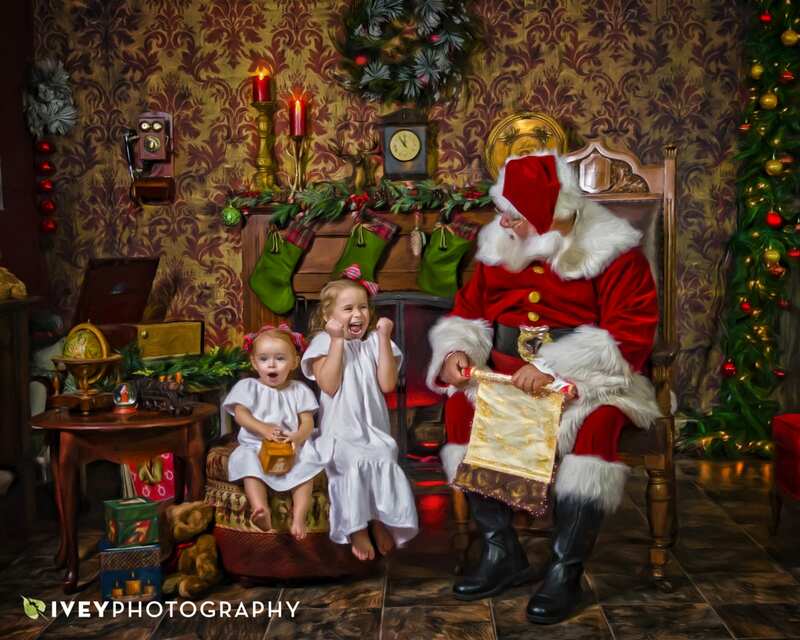 - Amy in Waco - "Our Santa experience at Ivey Photography was amazing. The look on my 3 year old daughter 's face when she first saw Santa was priceless. The Santa was very authentic and was wonderful with small children. He picked her up to sit in his lap and talked to her like she was his own. He played the part well showing her his workshop, having cookies and cocoa, and looking at the list of good girls and boys. It brings tears to my eyes looking at the innocence on her face and how much she believed in him. She left the studio so excited and asked the whole night to go back to visit with Santa. Also a job well done by the photographers, they always do an amazing job! Thank you for a wonderful experience that we will always treasure with beautiful pictures." - Misty in Cedar Hill - "My boys had a beautiful session with Santa for Christmas pictures. The boys got about 30-40 min of devoted time with Santa where he read to them, had milk and cookies with them, painted toys and several other wonderful things. It was a wonderful experience and the pictures are stunning, there are simply no words to do them justice! It was one of the most magical things I've experienced! We ordered Christmas cards and have received countless compliments from our friends and family that received one. I have had 2 large photos on my walls that arrived earlier this week and I can't stop starring at them! This will forever be a cherished memory with photos that will be family heirlooms!" - Stacy in Dallas - "We just did our pictures here and they were WONDERFUL! Perfect Santa and Mrs. Claus, and the photographer had a wonderful personality! They all made it so fun! The set was absolutely adorable! We had such a blast! I highly recommend getting Christmas pictures done here." - Sarah in Plano - "This was an absolutely MAGICAL experience for our girls! They loved every second and really felt like it was a date with Santa instead of a photo session. The pictures are precious -- sweet and candid appearing instead of forced and posed -- and we will treasure them always." Hold on while we prep for 2019! Now with locations in KELLER, MIDLOTHIAN and RICHARDSON!